An early morning start. 6 a.m. wake up, dress, down to breakfast and ready to go by 7. 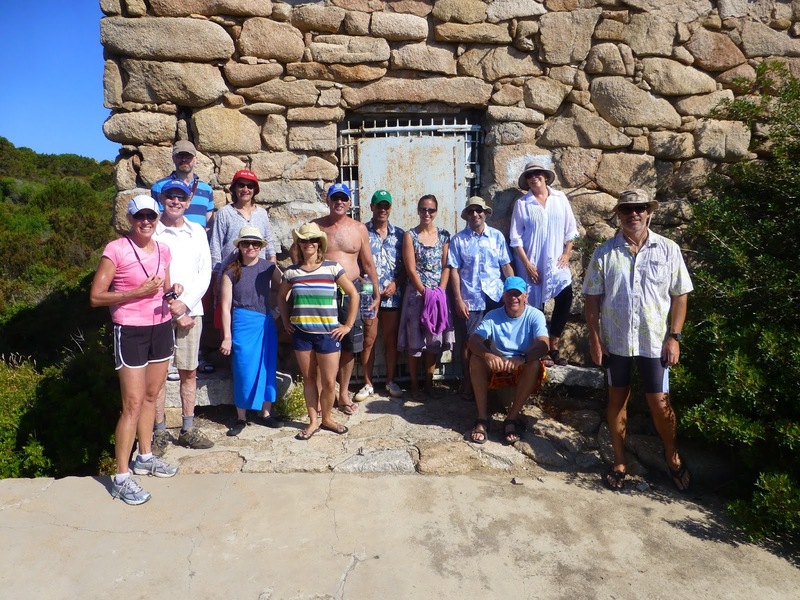 We had to beat the wind for an inter-island swim. 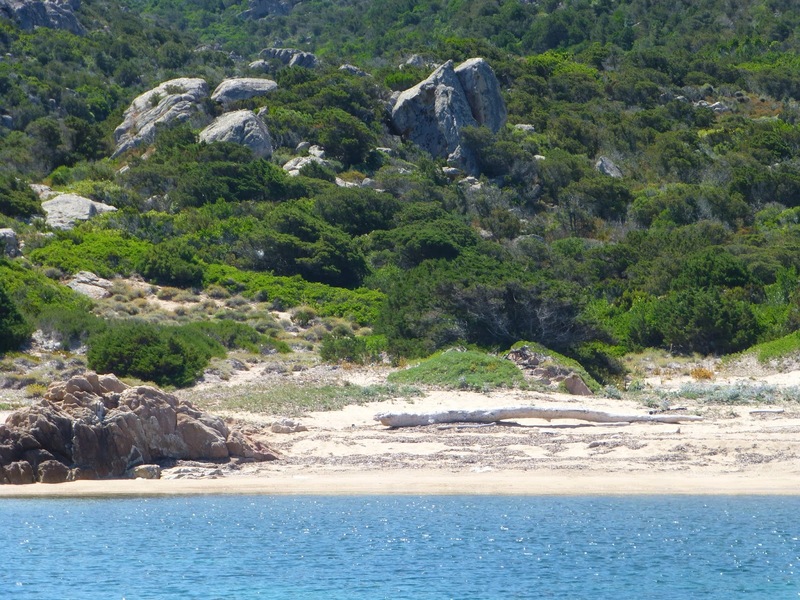 We headed down the sea to the right of the hotel and the swim was across the sea to Spargi Island. I decided not to do the channel cross. It was a 4 km swim all up. A 2km across the channel and then another 2km to the bay we were going to. It’s interesting travelling with Francesco in the rubber duckie. He gives me lots of insight into the swimming styles, points a out areas of interest and its good fun. The Yellow Caps are off to Spargi! 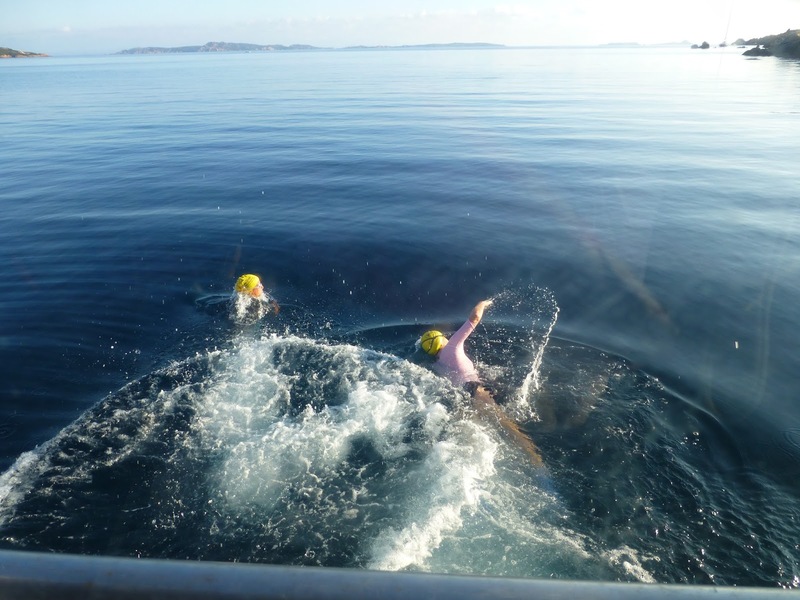 The yellow cap girls, Isabella and Liz did a great job, keeping a perfect line across the channel. The orange group with Steve did a little detour so ended up getting caught by the pink group headed by Clare from Canada, a real ball of muscle. I have taken to calling her Action Girl. 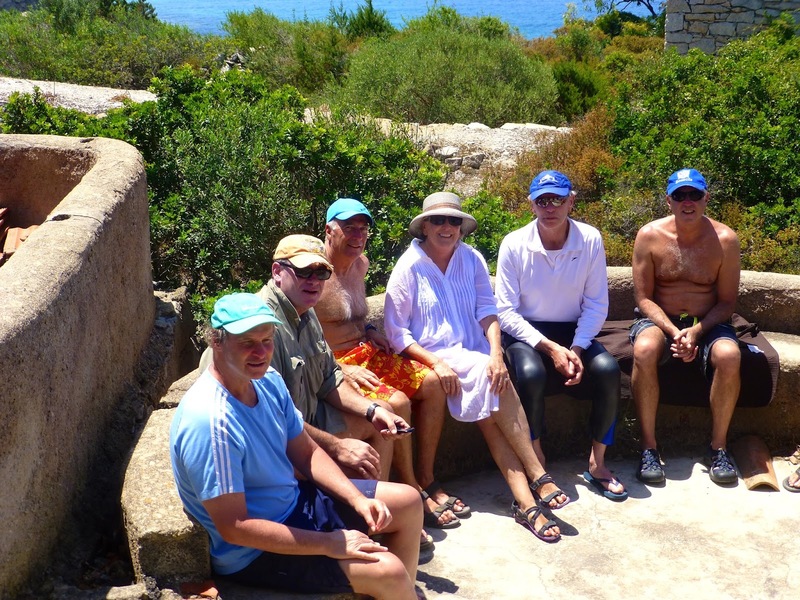 I joined them for the swim along the coast, around the headland and into the bay where we were having morning tea. After the break we headed off for the top of the hill, a walk though stony prickly bushes to the top where the bunkers from WW2 still exist. It was a half hour climb up then some sight-seeing and a half hour back. So quite energetic. 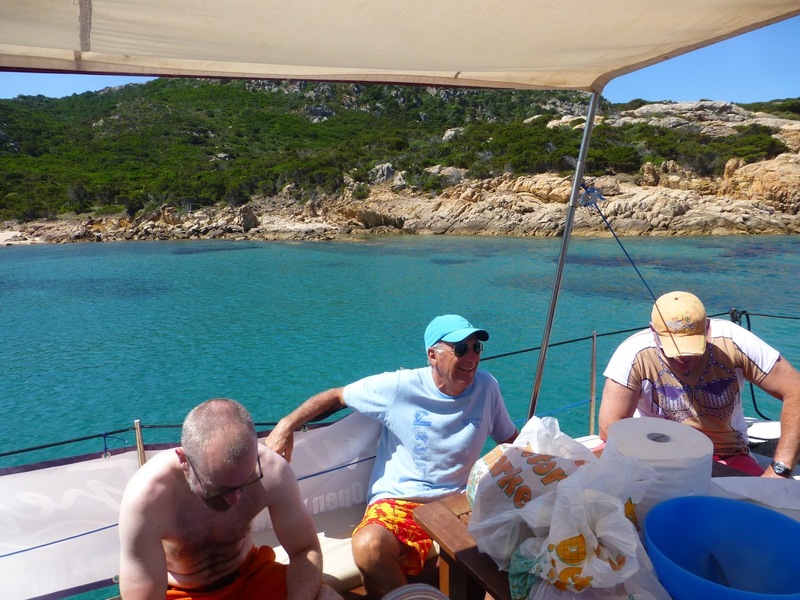 our guides decided the wind was too strong so we headed back across the channel to La Maddalena where we moored for lunch. Only problem. – Glenn had to drive the rubber duckie back to the hotel to get the rice, and on the way back the engine failed so Francesco – who was preparing our lunch had to take off to rescue him. So Marco the big boat driver took over. It provided us with a few laughs as we lounged on the deck of the boat. This is the life! Once again I hopped in half way through the 2.6 swim and really enjoyed the last 1.3 km. I’m getting a little used to it now and feeling stronger. We returned to the hotel for showers and a wrap-up analysis of our stroke. Quite a funny but informative critique of our swimming style taken with an underwater camera. Francesco was great and handed out lots of hints. Isabella in the yellow group has the best style but needs more strength to go fast. He said I had a great style for only 4 months swimming and gave me a few hints on how to improve.I’m feeling very pleased with myself and so encouraged. We did this over a few shared Prosecos – so all was good. We watched Australia win the stage of the Tour team time trials and are now in the room catching up before dinner. Tonight the whole group are going into town to La Perla Blu for dinner.Francesco has organised it and no doubt will wear his”night time” hat a rather cute beany style skull cap. He’s quite a gorgeous character. So far swim trek is going well. Not so nervous now!!!!! And the group are so encouraging.